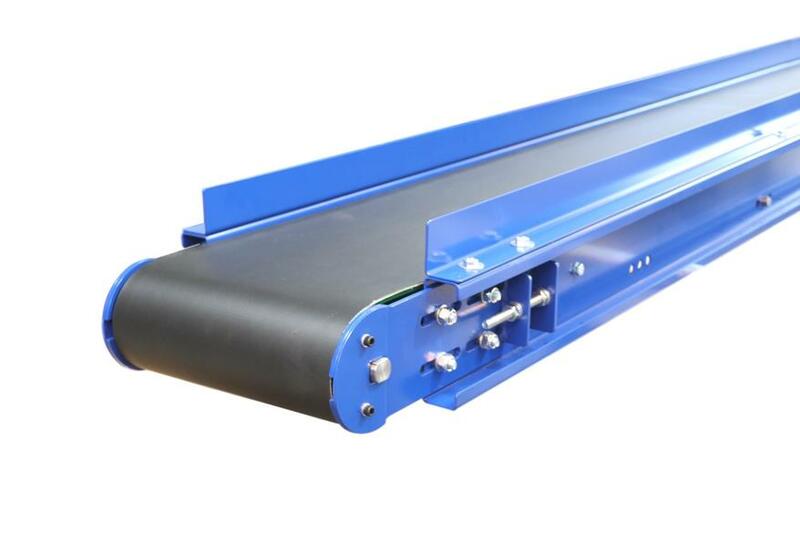 Conveyor Lengths = 1000mm - 20000mm. Belt Width = 234mm - 1284mm. Inside Frame = + 10mm. Total Width = + 80mm. Side Frame = Cold rolled grade 4 mild steel 2.5mm. 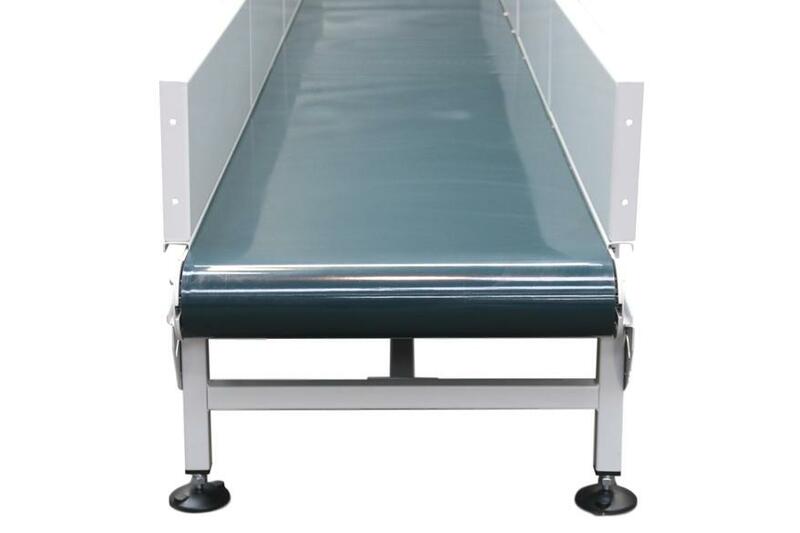 Bed Type = Steel slider, 4 sides folded and seam welded for additional strength. Conveyor beds = Semi suspended; complete with stainless steel spacing collars. Frame Ties = 20 x 20 x 2.0mm Mild steel complete with welded 5mm brace plates - Modular bolted fitment. Standard Belt Options = Twin 10 x 6 Tracking Guides Fitted to Belt underside virtually eliminating belt tracking issues and downtime. Under Rollers = P2 Galvanised 50 x 1.5mm ERW tubes fitted with precision bearings. 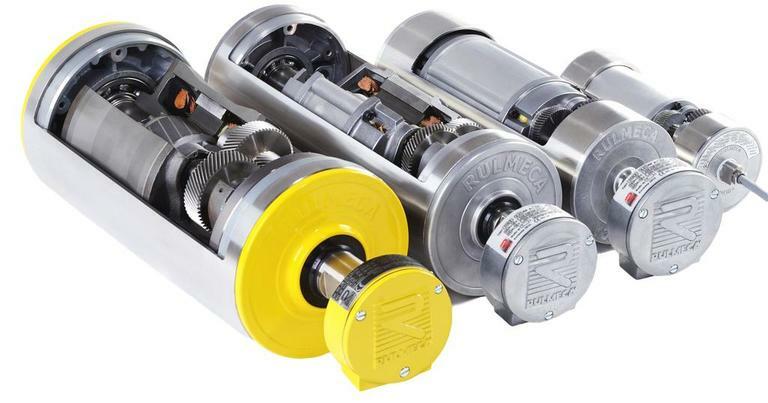 Drive Motor = Dual voltage, steel geared Internally driven 113mm diameter roller with 113 diameter pulleys. Tension = M10 x 120mm threads, allowing up to 240mm total belt tension. 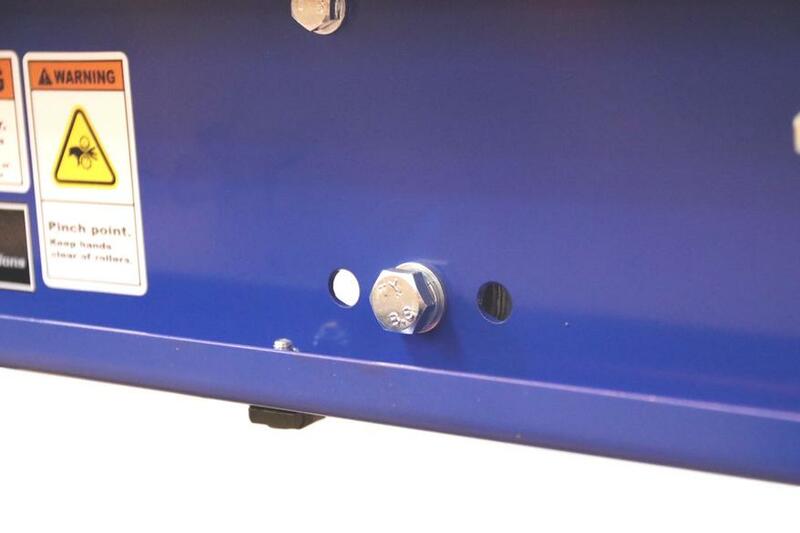 Conveyor End Plates = Fully welded tension plates, with 4 positions bolted fitment. 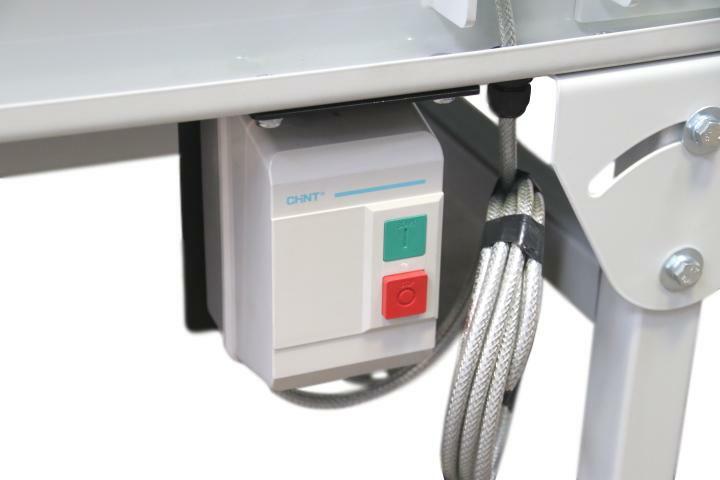 Quick access cover plates allowing ease of maintenance. Weight Capacity = 25kgs per meter standard / 50kgs per meter with specific drives. 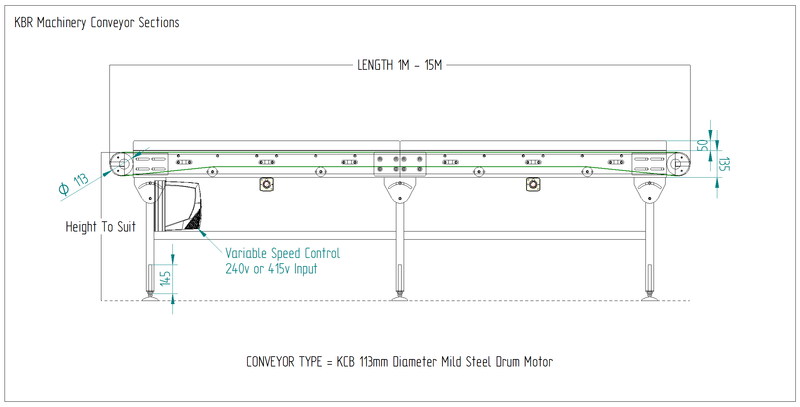 Conveyor Speed = Standard 20 Meters per minute maximum speed (alternative speeds are available). 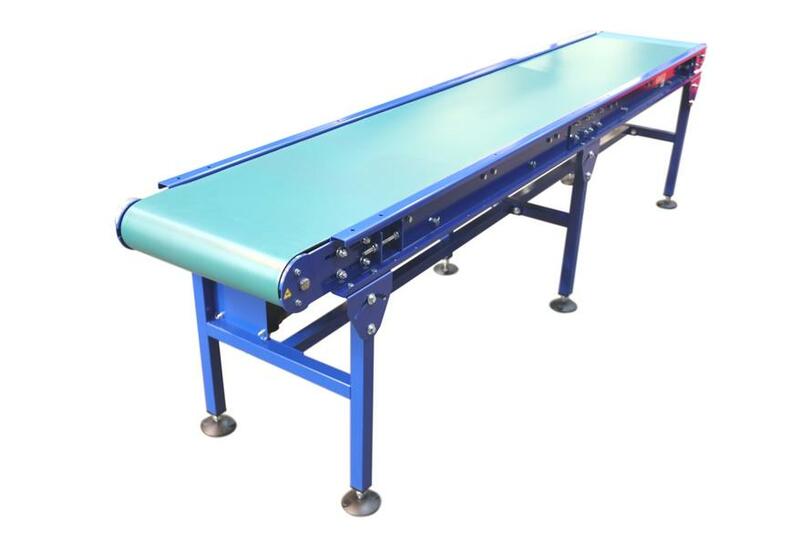 Conveyors are manufactured with four side folded semi-suspended pans. This allows fitting of 10 x 6 guides to the underside of the belt. Tracking guides virtually eliminate the requirement for belt tracking, which can cause equipment downtime and loss of production. Endless conveyor belting provides a seamless join between the PVC and fabric base, therefore increasing belt life. Standard additional belt types included Grip Belts, PU Blue, White PVC and Oil Resistant PVC. 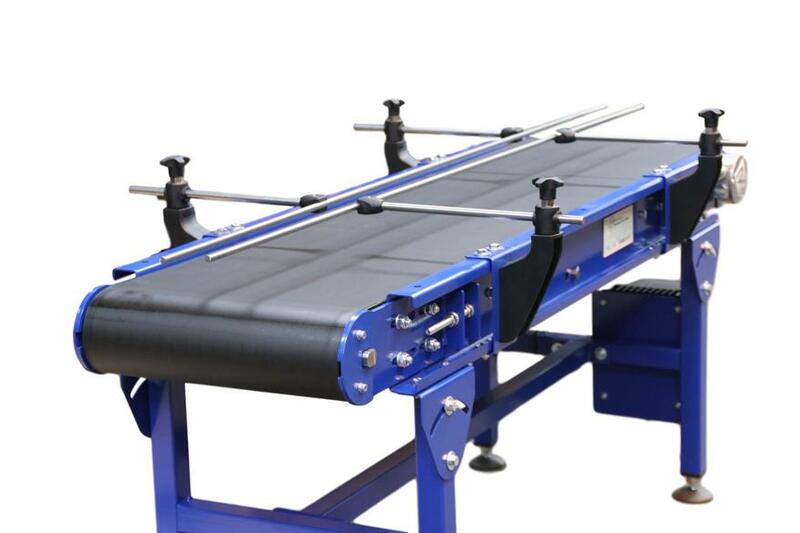 Conveyors are fitted with return rollers, offering adequate drum wrap and tension, along with providing belting support. P2 Galvanised 50 x 1.5mm ERW tubes fitted with precision bearings c/w machined female m10 threads. 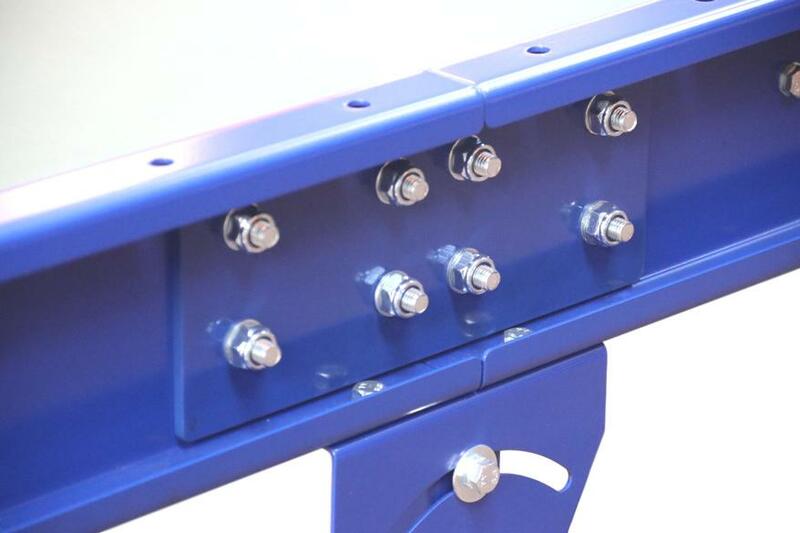 Conveyors are fitted with 5mm tension plates, incorporating a welded collar for increase roller support. For ease of maintenance, 2.5mm endplates can be removed to aid roller and belt replacement. Belt conveyors in excess of 2.5m are assembled in multiple sections. Durable 5mm frame joining plates are used in addition to central support for added stability. 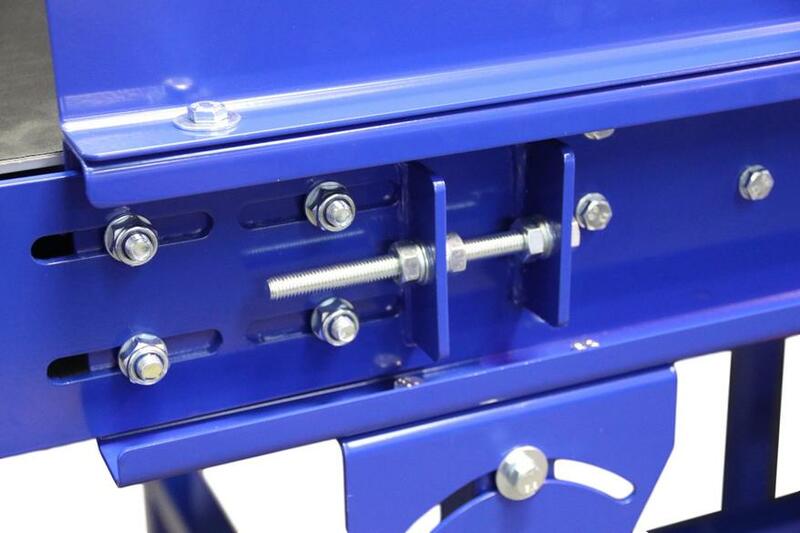 Our standard tension units allow simple effective belt tensioning and tracking. M10 x 120mm Threads, allowing up to 240mm belt tensioning over the conveyor length. 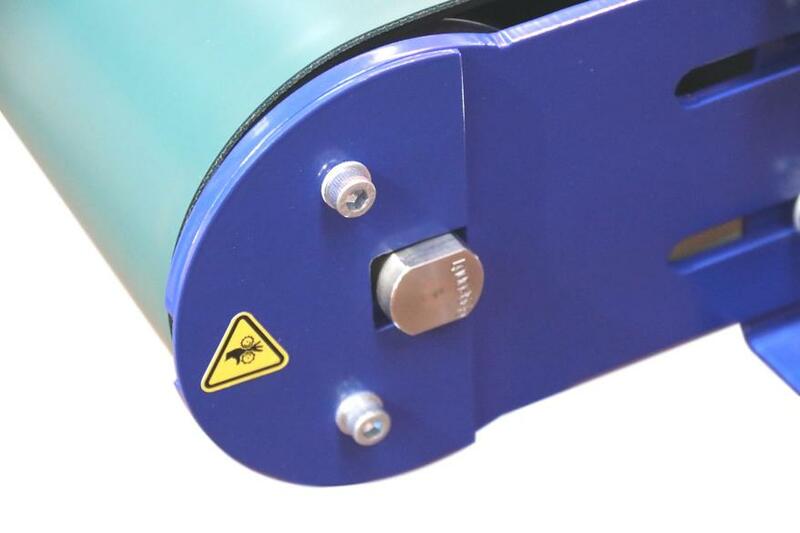 We offer a standard 50mm H Fixed Side Guide to all our belt conveyors. A permanent safety rail manufactured with 2.5mm mild steel. Additional options include 4 sides folded guards in the following increments: 100mm, 150mm, 200mm, 250mm, 300mm H side guards. We can also offer rubber side skirting affixed to guards, in addition to inset over the conveyor belting edge. Pivoting rail bracket, offer movement at progressive angles. For product positioning and bar coding and labelling machines. The KCB 113 belt Conveyor is manufactured from high-quality cold rolled CR4 grade 2.5mm mild steel. 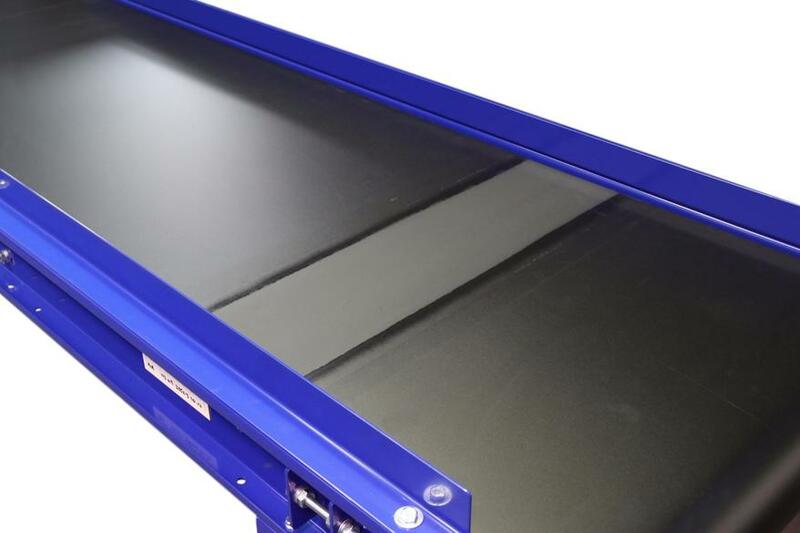 Conveyor side sections are CNC cut and folded to form a strong durable side section, in addition to a 4 side semi-suspended support pan, allowing our twin belt tracking guidance system. Offering a 135mm deep side section, the KCB 113 medium-duty belt conveyor is a durable conveyor section, meeting the high standards of all KBR Machinery's manufactured belt conveyor systems. The KCB 113 medium-duty belt conveyor, therefore, remains an ever popular, solid, robust and ultra reliable flat belt conveyor. The KCB 113 belt conveyors can be supplied in 3 standard colours, RAL5002 Ultramarine Blue, RAL 9010 Pure White, RAL 9005 Jet Black. Custom powder coated colours are available. Together with 304 stainless sections manufactured for food conveyor applications. The KCB 113 belt Conveyor incorporate Rulmeca 113mm diameter mild steel drive pulleys complete with hardened steel geared helical internal gearbox. Designed for arduous applications, including water, dust, grit, chemicals, grease, and oil. In comparison to a typical motor gearbox system, the 113mm diameter drum motor offers reduced energy consumption in addition to increased power efficiency, whereby drive power can be transferred along the full width of the belting surface offering higher mechanical efficiency. KCB 113 belt conveyors come as standard supplied with smooth 2 Ply PVC Black or Green conveyor belting. All belts incorporate our twin tracking guidance system, whereby the undersides of the external conveyor belting feature welded PVC notched or smooth guides. Manufacturing conveyor belting in this way exceeds belt life, preventing the constant requirement to adjust and align conveyor belting. Furthermore tracking guidance systems, prevent costly downtime and unnecessary ongoing conveyor costs. This is a textured belting profile, with a low friction fabric base, suitable for creating a positive drive on products, in addition to allowing inclined angles up to 20 degrees. This is a smooth belt type, slightly tacky surface. Ideal for a clean line looks within food packaging and inspection type applications. Smoothly textured conveyor belt with a diamond base, preventing ingress of water and chemical saturation. Offered in two sizes, 3.6mm + 5mm, this rigid durable belt type offers fantastic durability within harsh working environments. High oil resistance and chemical resistance in addition to offering a rigid belting structure for additional belt fabrication including flights, side walls, and chevron patterns. Offered in two sizes 4 + 6mm, this belt type has a fabric texture, offering a non-marking belt with high tear resistance. Typical industries included sheet metal sector. Straight or segmented flight 15 - 50mm fitting. Convoluted border-flex side walls from 40mm & 50mm H are also available. Vulcanized belting supplied as standard. Kit conveyors also feature vulcanized belts. Vulcanized conveyor belting offers a seamless join between the belting surface prolonging belt life. 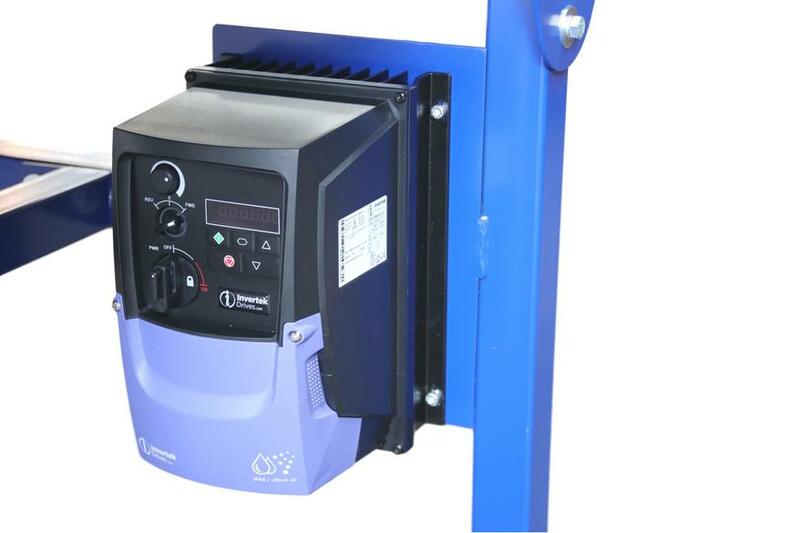 Variable speed control features include stop/start buttons, drive isolation, speed control dial and digital display feature. 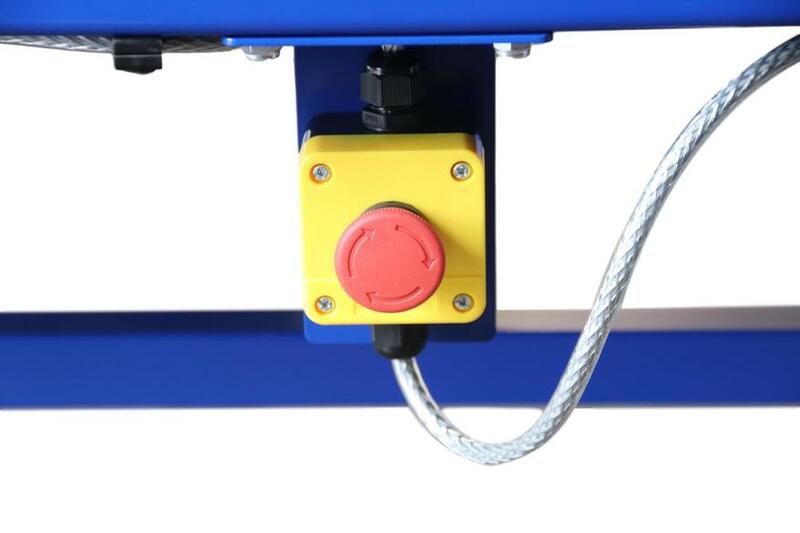 Emergency stops to suit the conveyor application. Emergency stop chords are also available. 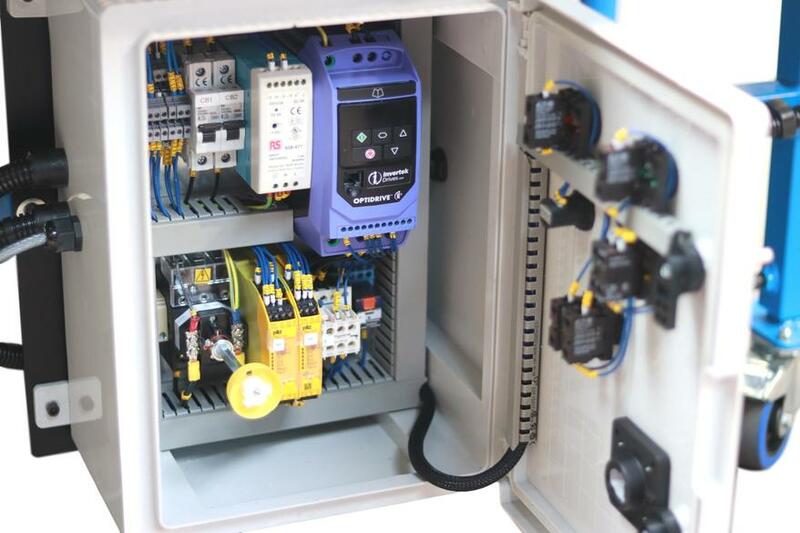 When further emergency systems are required, please contact us with the specification required. Advanced controls built to suit the application. This includes PEC Sensors, Timing Switches, Emergency stop pull chords, Panel Sirens, Lights, finger guards. Belt conveyors can also run from a central panel incorporating conveyors into systems of conveyors with multifunctional uses. Conveyors are Pre-built. Comprehensive instructions are provided for kit conveyors. Some require minimal assembly, and some a little more than simple assembly. 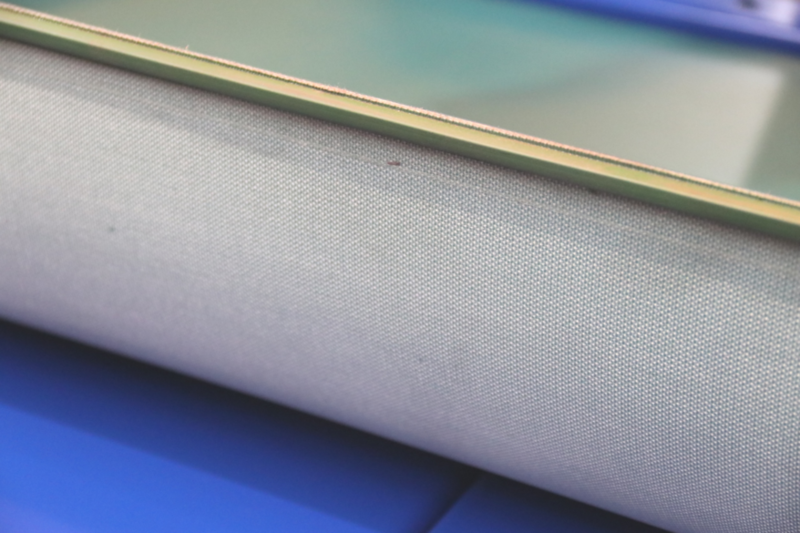 If you don’t think you could manage, or simply want the assurance of a professional installation and demonstration, we can offer an Installation service for an extra cost. To find out how much assembly is required on your conveyor, please contact us. Read the conveyor manual before use. Incorrect wiring can cause drive damage, voiding the warranty. Conveyors come with a 12-month warranty against defective parts. This excludes accidental damage and misuse. Wiring Diagrams and Instructions provided. CE marking and EU declaration supplied.